In the long run, you only hit what you aim at. To be a philosopher is not merely to have subtle thoughts; but so to love wisdom as to live according to its dictates. I went out to the country so i could examine the simple things in life. It is not what you look at, but what you see. However mean your life is, meet it and live it: do not shun it and call it hard names. Cultivate poverty like a garden herb, like sage. Do not trouble yourself much to get new things, whether clothes or friends. Things do not change, we change. Sell your clothes and keep your thoughts. God will see that you do want society. Cultivate the habit of early rising. It is unwise to keep the head long on a level with the feet. In our society leaving baby with Daddy is just one step above leaving the kids to be raised by wolves or apes. We must have infinite faith in each other. If we have not, we must never let it leak out that we have not. Under a government which imprisons any unjustly, the true place for a just man is in prison. The finest qualities of our nature, like the bloom on fruits, can be preserved only by the most delicate handling. Yet we do not treat ourselves nor one another thus tenderly. 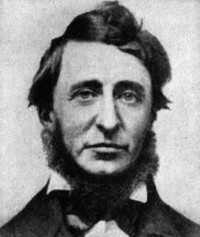 63 quotes by Henry David Thoreau.